Residential Solar PV and Thermal | A1 Sun, Inc.
Just like buying your home, an investment in an A1 Sun Solar System is a wise choice. 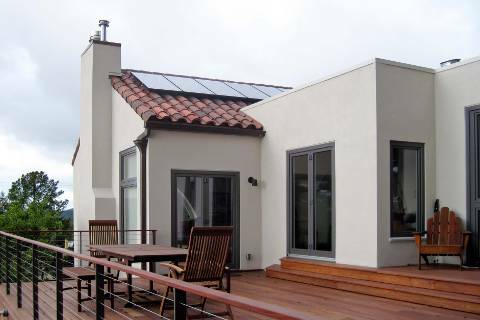 A well designed solar system adds lasting value to your home and is exempt from property taxes. There has never been a better time to install solar than now. The 30% Federal Solar Tax credit is in place, modules have come down in price, and the sun continues to shine in California. It is a fact that non- renewable energy prices will continue to skyrocket. An A1 Sun Solar System is a sensible decision, a long term plan, and a great investment. A1 Sun offers a custom on-site evaluation and Free Solar Estimate for your home. Create wealth. Solar makes financial sense. Very few investments add value to your home while being free from increased property taxes. Energy rates will only increase as new demand is created, electrical infrastructure ages, and fossil fuel scarcity drives prices higher. Generating your own electricity protects you from rising utility rates and produces income from day one. Hedge against higher energy prices with your solar system. Clean energy for yourself and our planet. If you are concerned about climate change - Take Action. You can eliminate your home’s carbon footprint. Generate abundant, renewable, fossil-free energy for yourself and your neighbors. Energy independence, from an individual, local or global perspective. As an Independent Energy Producer (IEP), feed your excess solar electricity into the grid and get paid for it. Now with AB 920, Net Surplus Compensation (NSC) is law. Your utility has to pay you for your excess production. Energy independence is a beautiful thing. Solar is valid for all of the above reasons and more. Our workmanship is guaranteed for 10 years. Your system will last much longer. We custom build with a 30 - 50 year design horizon. To achieve this goal, we use A1 Sun proprietary design, components, and installation techniques. We provide you with ways to use energy more efficiently and work with you to find what is best for your needs. We’ve seen solar companies come and go, but our history and reputation in the community proves our track record. Our A1 Sun commitment is to install the best solar systems for our customers. From the moment you contact the A1 Sun Team, you will have the best experience possible. While in the process of designing your system, we take the time to explain anything that may seem unclear. We give you options. It’s easy. We handle all the paperwork, permits and inspections. Our customers are the happiest solar producers in the country. Please read their testimonials. We have a perfect record of client satisfaction with BBB. Beginning in the 1970s, the A1 Sun management team designed, supervised, and built many solar projects. Over the years as technologies have changed, we stayed current with the evolution of optimal components and systems. Whether your site is a new or existing home, or a multi-unit building, we have a strong history of design, practical experience, and best practices to bring to your custom project. You won’t find 'shady salespeople' here. We don’t use slick, misleading and costly advertising gimmicks. Our sales approach is to provide you with the straight forward information, lasting workmanship and the best value. Any questions you have will be answered fully and any concerns you have will be addressed immediately. Now is the best time to go solar. A1 Sun stays current and is familiar with incentive programs to make sure you receive the best incentives available. There is a Federal Solar Tax Credit for 30% percent of the cost of the installed system after other incentives. The California Solar Initiative administered by PG&E issues a cash rebate based on the size and projected production of your system. Depending on your area, there may be additional solar rebate programs available. The fundamental photovoltaic effect was first observed by Hertz in 1887. The technology of photovoltaic cells is well established. Photons from the sun hit a cell composed of semiconducting material, energize electrons inside the cell, and when connected into a circuit create a current flow, and presto we have electricity. The electricity flows from the cells inside your modules to an inverter which converts DC electricity into usable AC electricity for your home, community and the utility grid.